The Salad Diet is found in Salad for Dinner, a recipe book created by chef Tasha DeSerio who began her career at the highly regarded Chez Panisse Restaurant and Café. This book is designed to help you turn salads into main meals and will appeal to both vegetarians and meat-eaters. The salad recipes provided in this book include a variety of ingredients going far beyond just raw leafy greens and other vegetables. The Salad Diet is divided into chapters, which focus on a particular style of salad. Chapters include simple salads, leafy salads, vegetable and fruit salads, grain-based salads and legume salads. The recipes are listed in order of the seasons; spring, summer, fall and winter. For each recipe, suggestions are offered to help you make lighter salads more satisfying. For example, depending on the type of salad you might add hard-boiled egg, grilled shrimp or roast beef. Salad greens, tomatoes, beets, peppers, cherries, apple, tangerines, anchovies, olives, capers, cheese, nuts, seeds, bread, pasta, brown rice, beans, eggs, seafood, chicken, pork, lamb, beef, Greek yogurt, mustard, olive oil, grapeseed oil, walnut oil, sesame oil, balsamic vinegar, wine vinegar, lemon juice, orange juice, kosher salt, black pepper, fresh herbs. 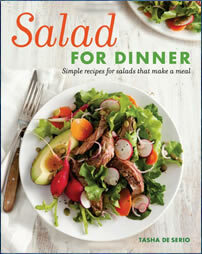 Salad For Dinner: Simple Recipes For Salads That Make A Meal retails at $19.95. Makes it easier to eat a lot of fresh vegetables and fruit. Salads are fast and easy to prepare. Provides guidelines on basic salad preparation techniques. Includes advice on selecting quality ingredients. Created by a well-respected chef. Recipes do not contain nutritional information. Won’t appeal to those who don’t like eating salad. Some of the ingredients are expensive. Most of the recipes contain relatively high amounts of oil. The Salad Diet includes a selection of recipes that will inspire readers to increase their intake of fresh vegetables, fruits, whole grains and legumes. While this salad diet is not designed to promote weight loss, eating more salads can make it easier to reduce calories. Additionally increasing the intake of fruit and vegetables can improve general health.